Christmas has been canceled in the town of Gloomsbury and something must be done. 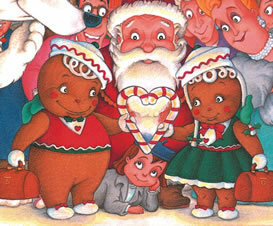 So the Prince and Princess of Gingerbread attempt to save the day in this fun-filled holiday classic. The spirited narration and lively musical score will whisk you through this merry tale about the true meaning of Christmas. Set includes The Steadfast Tin Soldier book and DVD, The White Cat book and DVD, and The Firebird DVD.